Jake and Dinos Chapman are amongst the most successful - and controversial - of the artists who came to fame as part of the generation of so-called Young British Artists in the 1990s. Amongst their most notable works are their reworkings of Goya's etchings, notably Los Caprichos and The Disasters of War series, where they transformed the heads of the victims into clowns' or puppies' heads. They gave the title 'Insult to Injury' to these reworked prints. Here they have translated some of this imagery - in which figures from the Goya originals have been given the garishly painted faces of clowns - into a wallpaper pattern. 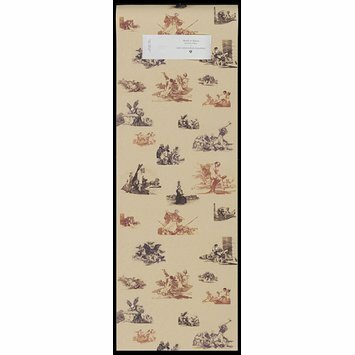 As a further reference to historic precedents they have based their design on traditional toile de Jouy textiles, with their style of presenting the motifs as decorative vignettes. Roll of wallpaper with image take from Goya's 'Disasters of War' modified with the addition of clowns' heads and so on. Wallpaper, 'Insult to Injury', Jake and Dinos Chapman, UK, 2009.